Kuomintang (KMT) party flag and the ROC naval jack. A white Sun with twelve rays on blue background. 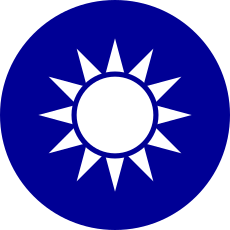 The Blue Sky with a White Sun (Chinese: 青天白日旗; pinyin: Qīng tīan bái rì qí) serves as the design for the party flag and emblem of the Kuomintang (KMT), the canton of the flag of the Republic of China, the national emblem of the Republic of China and as the naval jack of the ROC Navy. In the "Blue Sky with a White Sun" symbol, the twelve rays of the white Sun representing the twelve months and the twelve traditional Chinese hours (時辰 shíchen), each of which corresponds to two modern hours and symbolizes the spirit of progress. 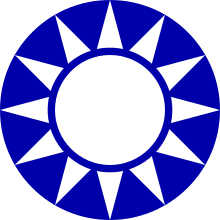 The "Blue Sky with a White Sun" flag was originally designed by Lu Haodong, a martyr of the Republican revolution. He presented his design to represent the revolutionary army at the inauguration of the Society for Regenerating China, an anti-Qing society in Hong Kong, on February 21, 1895. During the Wuchang Uprising in 1911 that heralded the Republic of China, the various revolutionary armies had different flags. 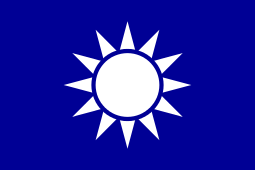 Lu Hao-tung's "Blue Sky with a White Sun" flag was used in the provinces of Guangdong, Guangxi, Yunnan, and Guizhou, while the "18-Star Flag", "Five-Colored Flag", and other designs were used elsewhere. When the government of the Republic of China was established on January 1, 1912, The "Five-Colored" flag was adopted as the national flag, but Sun Yat-sen did not consider its design appropriate, reasoning that horizontal order implied a hierarchy or class like that which existed during dynastic times. Thus, when he established a rival government in Guangzhou in 1917, he brought over the "Blue Sky with a White Sun" flag for the party and the "Blue Sky, White Sun, and a Wholly Red Earth" (青天白日滿地紅) flag, which was then the naval ensign, for the nation. This officially became the national flag in 1928 while the "Blue Sky with a White Sun" flag was adopted as the naval jack. 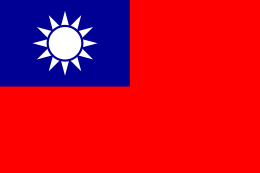 The "Blue Sky, White Sun, and a Wholly Red Earth" flag has remained the flag of the Republic of China (Taiwan) to this day. Twelve Symbols national emblem, national emblem of the Republic of China (1913-1928) and the Empire of China. The national emblem of the Republic of China was derived from the Blue Sky with a White Sun flag. The emblem was designed by He Yingqin at Whampoa Military Academy in 1924 and was set as the national emblem by the Law of national flag and national emblem of the Republic of China in 1928. On the national emblem rays of sun have some distance to the edge, symbolizing the broadness of the sky, while on Kuomintang emblem the rays reach the edge, symbolizing the spirit of revolution is as powerful as the sun. The national emblem of the Republic of China from 1913 to 1928 is called Twelve Symbols national emblem (十二章國徽), based on the traditional symbols on clothes of ancient Chinese emperors. It was designed by Lu Xun, Qian Daosun and Xu Shoushang on August 28, 1912 and was set as national emblem in February 1913. It remained as the national emblem during the Empire of China from 1915 to 1916. After the Northern Expedition it was replaced by the Blue Sky with a White Sun national emblem in 1928. The KMT and ROC flags displayed at a party building in Kaohsiung. In the early years of the Republic, under the KMT's political tutelage, the Qīngtīan Báirì Qí shared the same prominence as the ROC flag. A common wall display consisted of the KMT flag perched on the left and the ROC flag perched on the right, each tilted at an angle with a portrait of National Father Sun Yat-sen displayed in the center. After the promulgation of the Constitution of the Republic of China, the party flag was removed from such displayed and the national flag moved to the center. Since the ROC government moved to Taiwan and especially in the years since the end of martial law the KMT flag has lost some of its prominence. 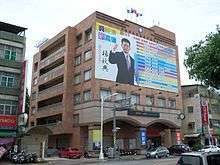 However, it is still frequently see on KMT party buildings in political rallies and other meetings of KMT and the pan-blue coalition. The flag and the KMT party emblem made news during the ROC legislative elections of 2004, when President Chen Shui-bian suggested that the Kuomintang's flag and party emblem violated the ROC's National Emblem Law for being too similar to the national emblem of the Republic of China. Chen stated that the law forbids the ROC's emblem and flag from being used by non-governmental organizations and warned that the KMT would have three months to change its flag and emblem if his Democratic Progressive Party won a majority of seats in the legislature. The KMT responded by asking the government to change the national emblem, saying the KMT emblem existed first. However, the pan-green coalition failed to win a majority, and Chen took no action for the remainder of his presidency. 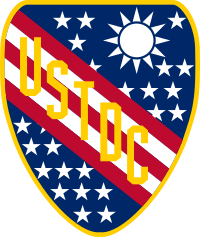 The design of "Blue Sky with a White Sun" was used in the unit insignia or coats of arms of some units of the United States Army that fought in World War II. 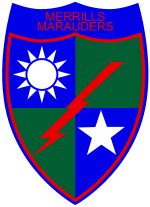 The most famous unit was Merrill's Marauders (officially named the "5307th Composite Unit (Provisional)"), which has the "Blue Sky with a White Sun" as part of its badge. The usage by American troops was a result of cooperation between US and Chinese Expeditionary Force in the China Burma India Theater. 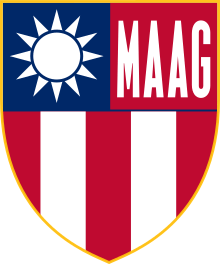 Postwar US military units stationed in Taiwan, including the United States Taiwan Defense Command (USTDC) and the Military Assistance Advisory Group (MAAG), also used the design in their badges. Up to now, the "Blue Sky with a White Sun" can still be seen in the emblem of the 75th Ranger Regiment. 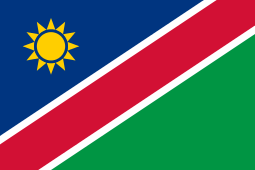 The symbol also applies to Namibia. in which the sun is gold in their flag. Hong, Caroline (23 Nov. 2004). Debate heats up over claims to the sun. Taipei Times. Wikimedia Commons has media related to Flags with blue sky and white sun. 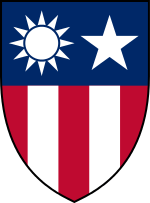 Wikimedia Commons has media related to Coats of arms of Taiwan.